White supporters of Bernie Sanders' presidential campaign don't see that white progressive politics is identity politics - rooted in the white experience. Black Lives Matter activists interrupt Bernie Sanders at a rally in Seattle. Credit: Demotix/Alex Garland. I lived for nearly 25 years in Portland, Oregon. There I staffed an organization dedicated to fighting vigilante white supremacists. In order to fight the white right, we built a base that was made up almost entirely of white progressives. I also served as the Executive Director of the McKenzie River Gathering Foundation, a financial resource for progressive causes in Oregon. The foundation is supported almost entirely by wealthy white progressives. During my years in Portland, I also worked to end the prison build-up through a group made up of incarcerated people and their loved ones. The prison population in Oregon is disproportionately Black, but majority white. Portland is not far from Seattle, a city I lived and worked in while I served as a program officer, and eventually the director, of Social Justice Fund Northwest, a five-state regional public foundation dedicated to progressive causes, especially the cause of racial justice. That group also had a base of donors that was primarily white and progressive. The Pacific Northwest is so overwhelmingly white that some jokingly refer to it as the Great White North. In a region where white people are so overwhelmingly the majority, racism becomes all the more difficult for the white majority to see. Even when it becomes visible, it’s all to easy to ignore. In my years in the Northwest, I found that pointing out racism can result in retaliation, even from left-leaning whites. I was sometimes labeled a provocateur, or, worse, accused of creating fictions in order to use innocent people I was falsely accusing of racism as whipping boys on whom to vent my anger over something else. I say this to make a point: I know something about white progressives. I may even be something of an expert on the subject, though I can’t claim objectivity because, over the years, many of them have become close friends. More than anything, what I’ve learned is that we’re all just human after all. 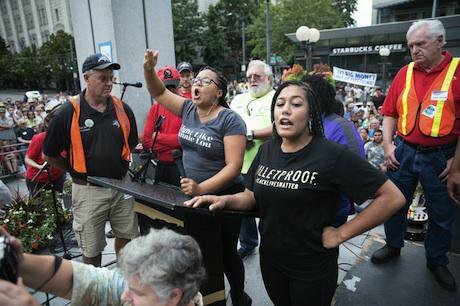 It was these years of experience that made the much discussed disruption of a mostly white rally in Seattle featuring Bernie Sanders by #blacklivesmatter activists of such interest to me. The disruption catalyzed an exaggerated version of the same racial dynamics that loomed large in nearly every struggle I have been involved in in the Northwest. And, as usual, to no good end. Moreover, the discussion following that incident feels like it’s turned into a referendum on a whole movement, bordering even on a contest over the primacy of race or class in progressive politics; a contest that has been waged since, well, forever in terms relevant to this moment. All that incited by two Black women, just two, saying something that we should be listening to if we really do believe that Black lives matter, no matter how or to whom they said it, and maybe especially for just those reasons. We should be listening if we are concerned about the crisis of racism in America because acting on that concern must begin with consideration of our own racism. And isn’t that the demand that angered folks the most? If we don’t begin there, we are misunderstanding how deeply rooted and ubiquitous racism is in America. We are a profoundly racist state, founded upon native genocide and race slavery, divided by a civil war fought over the simple proposition that Black people are human beings, and today, still, a country deeply divided over issues that disproportionately affect people of color – issues like immigration, mass incarceration, drug criminalization, Islamophobia, the so-called war on terror, welfare, food stamps, educational equity, Obamacare (on which the deepest divisions are in the blackest states of the South). And the list goes on. In such a state, do we really suppose that racism is only a problem of other people? The trouble is, too many whites can’t seem to see that white progressive politics is identity politics, which means it is rooted in the white experience, just as much as is Black movement politics, Asian movement politics…all politics. Many white progressives sincerely long for racial reconciliation and justice. I think I’ve had intimate friendships with enough of them over years of nurturing the activist aspirations of white progressives, and assuaging the fears of white mothers with children in prison to know that well enough. Their ideas about race are often muddled, but their confusion makes them no less sincere. The trouble with white progressives, and I mean as an aggregate and not individually, was demonstrated by what went down at that rally. Racist diatribes, booing, counter-chants of “All Lives Matter!” In fact, enough commotion among the mostly white crowd to make two little Black girls backstage fall into the arms of State Senator, Pramila Jayapal, crying in fear. The trouble is, too many whites can’t seem to see that white progressive politics is identity politics, which means it is rooted in the white experience, just as much as is Black movement politics, Asian movement politics…all politics. The personal really is political, not just for women and people of color, but for everyone. And white is an identity forged of fear of the other and entitlement to race privilege. If you agree, then consider this. Maybe when white progressives see a man like Bernie Sanders, a courageous leftist undertaking the bodacious act of running for president as a self-proclaimed socialist, they identify with him not just as a progressive, but as a white man – as representative of them. Sanders, in this scenario, serves as a redeemer of white identity, lifting it above racist, reactionary, angry white conservatives who have so dominated our political culture. By doing so, maybe Sanders is feeding not just a desire for vindication, but a sense of entitlement to recognition and respect that can’t be separated from whiteness without some winnowing. Maybe. But that’s just a theory. What I will venture to say is concretely true is that regardless of what drove the vitriolic reaction on that day, it was a mistake, and those who are criticizing the movement for Black lives as lacking in political savvy and organization in the wake of that incident are holding those women to a double standard. Those white progressives did just what I’ve heard many white progressives accuse those women of. They let their emotions overtake them, and made the confrontation all about them, and not the greater good. Reacting as many in that white majority rally crowd did polarizes things with too few people on either side of a two-sided fight between two as yet minority (that we dream will become majority) interests, making enemies of natural allies while allowing the conservative opponents of both sides to position themselves as the reasonable majority. That’s a lose-lose proposition. We progressives may be growing as a portion of the electorate, but we are still underdogs in an uphill fight. We can’t afford to alienate our natural allies, and, have no doubt, people of color whose interests have been forged in the fires of racial injustice are natural allies of the progressive cause. We understand justice and have less to lose and more to win by laying it all on the line for progressive change. You want to be our friends, not our enemies. Sometimes, that means you gotta lose to win. And have no doubt, you’re not going to win us over by simply trying to envelope us in a race-blind progressive agenda. For many white progressives, getting right with this reality will mean having to figure out how to address race and class at the same time. I know a lot of folk find that a rough road to walk, but it might help to consider this: race is a form of class. American white supremacy was invented as a system of labor exploitation. It is rooted in slavery, which classed blacks as chattels. But, slavery was the means, not the end, where white supremacy was concerned. Racism justified and greased that race-based labor exploitation system, but was not it’s primary intended product. White supremacy was created to produce profit. Under white supremacy, all are classed by race, not just those who are most exploited, but their exploiters as well. And within each class, all are equal by virtue of culture and biology, or at least that’s the original idea. So, that means that a poor white person is equal by race to Donald Trump, even if the gap in power and wealth between poor and even middle class white people and Mr. Trump is as wide as the wealth gaps of some whole countries. Relying on people to lean on white rather than push back against that inequity within the white class is the gambit of the elites who most benefit from white supremacy, and that makes the cause of ending racism an issue of economic justice for everyone, including white people. If white progressives can’t get with this idea, that gigantic, gaping hole of inequity, a hole leveraged in no small part by racism, will be next to impossible to close. In fact, believing that class trumps race limits our ability to close that gap. It is a form of blindness, of color blindness in fact, that is against the interests of white working people as much as it is against the interests of people of color. So, if you want to come good on this issue, listen up. Rather than sit paralyzed over the perception that the movement for Black lives isn’t making demands, isn’t organized in the way you’d like it to be, is, in fact, what all movements are, especially at this early stage, which is a cultural phenomena, not a single political organization, here is another way of understanding what went down in Seattle and is going down and will continue to go down all over the country. The movement for Black lives is a call for justice beginning with an end to state violence against Black people. That means police accountability among a wide array of other issues. Those issues have been around for generations. Black leaders have been fighting to end racial profiling, harassment, violence, and mass incarceration for decades. In fact, these demands have been made in explicit, detailed terms again and again at every level of government for as long as there has been an NAACP, the Urban League, and numerous other Black-led national policy advocates, and hundreds of local Black-led organizations active at the city and state level. Specific proposals have been presented, specific demands put on the policy making table and presented to the general public, repeatedly, and largely to no avail. That Black leaders have been willing to rise above the humiliation of being patronized and tokenized while their issues have been ignored – that so many have stayed in the fight in the face of this – is nothing short of amazing. It is a demonstration of political maturity and determination from which all of us can take a lesson. Black voters are so vital to the Democratic Party that even here in supposedly liberal California, Senator and liberal icon Barbara Boxer owes her seat to Black voters, and Black women voters in particular. Without Black voters, she can’t win, nor can a Democrat hope to win the presidency in 2016. Yet, as a Party, Democrats have done next to nothing to earn those votes except make the Party out to be the lesser of two evils. What this amounts to is exploiting Black oppression. Yes, I know it’s not the intention, but the road to rally disruptions is paved with good intentions. Now, at last, the movement for Black lives has created the context within which those who have been advancing policy solutions to end the incredible police violence and over-criminalization and incarceration faced by Black people are now just beginning to get a real hearing. This after decades of struggle, including the fifty year long conservative rollback of Black civil rights, and the decades of exploitation of anti-Black racism on the part of both Republicans, especially in service to the Southern Strategy, and Democrats (remember Bill Clinton, anyone?). If folks don’t know what the issues are behind the movement for Black lives, they haven’t been paying attention. In fact, by asking, they are making the case that saying All Lives Matter rather than Black Lives Matter just doesn’t cut it. It shows us that we’ve talked about “all” people as though there are no Black people for too damn long. This article was originally published on Race Files.